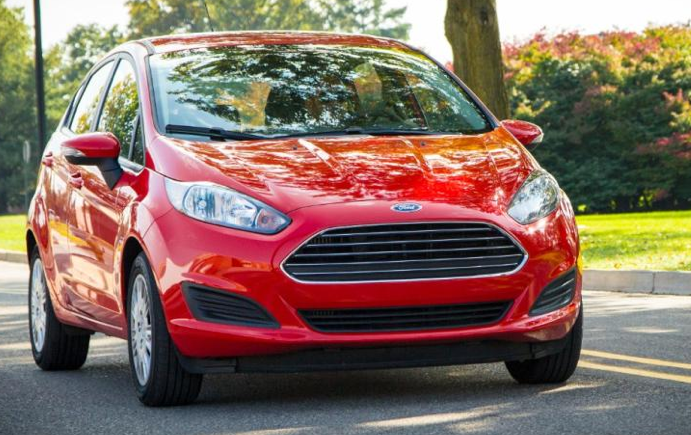 One of the appealing things about the 2014 Ford Fiesta hatchback is, or should be, affordability. 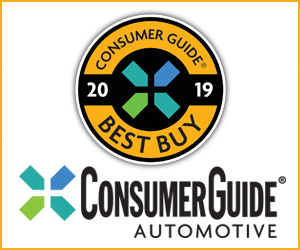 The SE model that Consumer Guide® tested topped out at $18,585 with options and destination—not outrageous for a solid-feeling and decently equipped subcompact. 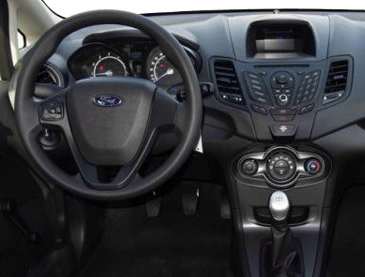 Our Fiesta’s interior was pleasant enough, and more than decent given the $16,000 base price. Too bad that spirit of value didn’t carry over to the fuel tank. While in this driver’s care, the test SE hatchback with the optional Ecoboost 1.0-liter turbocharged 3-cylinder engine and 5-speed manual transmission averaged 27.8 mpg over 160 miles, 70 percent of which were under city-driving conditions. That’s well shy of the car’s EPA ratings of 31 mpg city/43 mpg highway, and 36 mpg in combined driving. I don’t get it. I was just driving here. It’s not like I was out all night courting stoplight challenges from reckless delinquents in Smarts and plug-in Priuses. 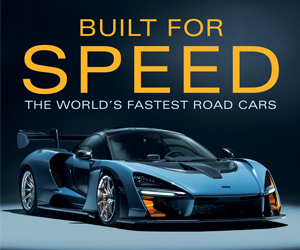 The 1.0-liter direct-injection engine makes 123 horsepower at 6000 rpm and 125 pound-feet of torque at 2500 rpm. While not a tornado of torque, it is a little more than that of the Fiesta’s standard 1.6-liter 4-cylinder, and it peaks at half the four’s required revs. The turbo three is a $995 option for the hatchback, and comes with 15-inch steel wheels (in place of standard alloys) and a regenerative brake system. The EcoBoost is available only with the 5-speed stickshift that’s fairly precise if a little long in the throw. There’s nothing particularly quirky about the engine’s operation except that it can drain off revs kind of quickly as it slows, so some judicious downshifting goes a long way to keeping the experience pleasant. A cooperative, easily modulated clutch helps in this pursuit. Ride was pleasing, with decent bump absorbency and perhaps a little more quiet than might be expected from such a small car. Body lean was nicely controlled, but steering, while easy, lacked feedback to the driver. Stopping with the front-disc/rear-drum brakes was swift and predictable. This 5-10.5 driver found enough leg room to be comfortable behind the pedals and manual tilt/telescoping steering column, and enough head room to make entry and exit easy. Rear passengers will be substantially more cramped. When I sat in back behind the passenger seat, which was retracted just a little further back than my own driving position, my knees were absolutely pressed into the back of the seat—and that’s even with the seat back recessed to create extra room. Ford claims 5-passenger seating, but the 3 in back will have to be kids. The center of the floor in back is taken up by a low “consolette” with a cup holder and a 12-volt power plug. Head room isn’t as good in back, either. A sturdy, but not sumptuous, cloth covered the seats. At least the upholstery was somewhat eye-catching with an embossed pattern on the surface. The upper portion of the dash had some “give” to it and there were cloth inserts on the door panels; otherwise hard plastic was the dominant material throughout the cabin. A standard leather-wrapped steering wheel was one welcome upscale touch. As for controls, a small digital display of vehicle information was wedged between larger tachometer and speedometer dials. The digital display could be cycled through via a plunger button that also served to easily reset the trip odometer. A small display screen atop the dash showed audio information. Audio controls were in a series of buttons on two winglike panels in the center of the dash. Below them sat climate controls: a circular cluster of function push buttons flanked by easy-to-use rotary dials for fan speed and temperature. 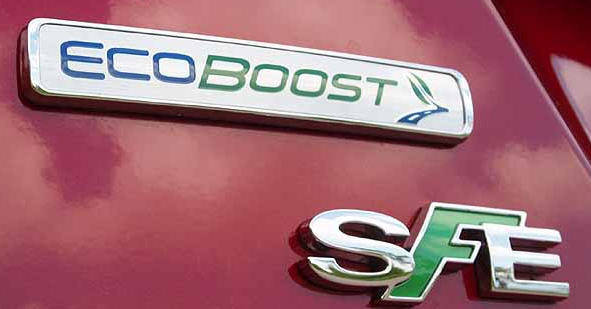 The $995 SE EcoBoost Fuel Economy Package includes this cool SFE (Super Fuel Economy) badge. Interior storage is mostly a front-seat proposition: glove box, 2 in-console cup holders, squarish covered console box, and large door pockets with bottle holders. Rear occupants only get the aforementioned floor cup holder and a pouch attached to the back of the right-front seat. Under the rear hatch is a cargo area with a low, flat floor to maximize the limited room available behind the second-row seats. That does create a substantial lip around the hatch opening, however. Split rear seats fold in a 60/40 break, but they don’t fold anywhere near flat, and you’ll have to remove the head rests first. Standard equipment on the SE hatchback includes dual power mirrors, a rear spoiler, ambient interior lighting, dual vanity mirrors in the sun visors, air conditioning, a 6-speaker audio system, electric power steering, keyless remote entry, and Ford’s Sync system with voice-control and app-access capabilities. Several packages and stand-alone options like the MyFord Touch infotainment system, navigation, satellite radio, and a power moonroof are available at extra cost, but by then this Fiesta could be one party that’s getting out of hand from a cost standpoint. With the EcoBoost 3-cylinder engine, Fiesta is a joy to drive enthusiastically but something of a pain to drive conservatively–a shame, because I had very high hopes for this engine. In traffic, I found that I was constantly a gear too high to find any torque, as the tiny engine simply refuses to pull revs when out of its very narrow rev-range comfort zone. 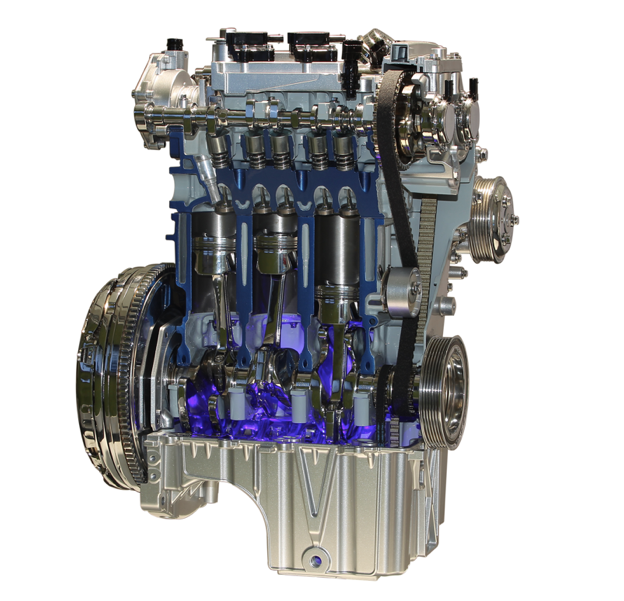 The 1.0-liter, 3-cylinder EcoBoost engine generates decent power when pushed but can disappoint in low-speed driving. But push the car and it comes alive. Keep the revs up and Fiesta is all sorts of fun to drive. The shifter is light and slick, the clutch precise, and the steering quick. Fiesta leans a bit more in corners than you might expect, but not excessively so. But what of fuel economy? Seems that pushing the Fiesta SE with EcoBoost engine, as you’re wont to do, cuts into the expected gas savings. Bonus bummer: I could not get our test car to link via Bluetooth to my phone, a hassle in Illinois where phone use while driving is strictly forbidden. Despite our inability to wring maximum MPGs from our test car, I wouldn’t attempt to talk anyone out of buying a 3-cylinder Fiesta, as long as they’ve test-driven the car and know what they’re getting into. I expect that someone serious about conserving fuel—and not paying much for a new car—can learn this Fiesta’s eccentricities and milk it for far better mileage than we saw. Written by: The Daily Drive staff on July 25, 2014.on February 27, 2018.